Now for the exciting continuation of last week’s debut episode! Returning to where we left off last week, the Patorangers are now able to trasnform and they immediately start fighting against the Lupinrangers, trying to arrest them. The Lupinrangers attempt to escape in their Dial Fighters, at which point the Patorangers give chase in their Trigger Machines, cutting to the opening credits. Following the opening credits, we see both teams fighting each other using their Dial Fighters and Trigger Machines, each using their respective vehicle’s battle mode but the Lupinrangers manage to escape. Arriving at Bistro Jurer, the Lupinrangers are discussing why the Patorangers have VS Changers. Kairi goes off out in search of clues when he sees Keiichiro at the warehouse, making a promise to defeat the Gangler, Garatto. The scene cuts to to Touma and Umika in different locations before returning to Kairi in an alley when we see a flashback showing how they originally got their VS Changers as well as how they met Kogure. After that, we see Garatto attacking people in a shopping mall using his piece of the Lupin Collection before briefly cutting to seeing both Kairi and the Patorangers head towards the scene. Returning to Garatto who is now outside, Kairi fires a shot at him. 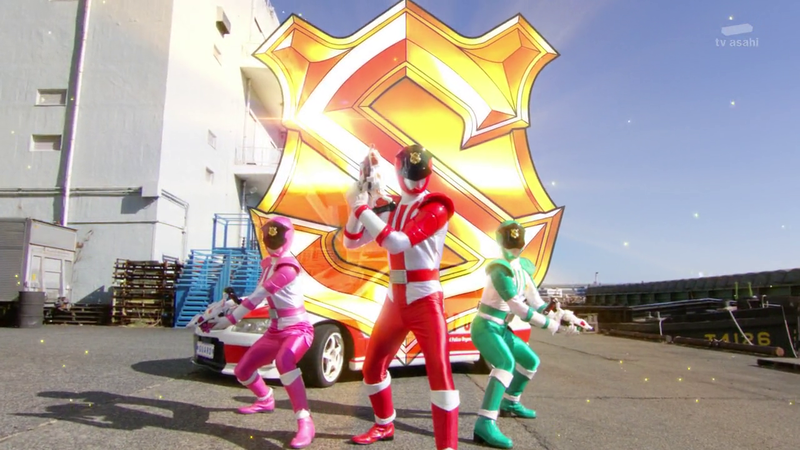 Kairi, Touma and Umika then transform into Kaito Sentai Lupinranger where the fight between the Lupinrangers and Garatto begin. Keiichiro, Sakuya and Tsukasa arrive and attack Garatto and the Lupinrangers before they transform into Keisatsu Sentai Patoranger. As the fight between the Patorangers, Lupinrangers, Garatto and his Pordermen continues, we see the Lupinrangers suddenly leave after obtaining the piece of the Lupin Collection that Garatto had in his safe, subsequently leaving the Patorangers to defeat Garatto. After they defeat the Pordermen, we briefly cut to the nearby Lupinrangers exchanging dialogue about letting the Patorangers defeat Garatto. During this brief respite, Patoren Nigou pulls out a case containing another piece of the Lupin Collection: Good Striker. Patoren Ichigou then loads Good Striker onto his VS Changer and activates it’s ability which allows the three Patorangers to merge into Patoren Union and unleash a devastating final attack that destroys Garatto, called One-Shot Strike. The three Patorangers, currently in one body, suddenly question why they’re all fused in one body. The scene cuts to Dogranio Yabun’s mansion where Yabun asks Goshu to give Garatto another chance by using her piece of the Lupin Collection. The three Patorangers, still in Keiichiro’s body, start to argue with eachother while the nearby Lupinrangers mocking them. Goshu suddenly appears and makes Garatto turn into a giant. The Lupinrangers react by summoning their Dial Fighters and attacking, when Good Striker starts to converse with the Patorangers and reveals his ability to think for himself. Good Striker has decided to help the Lupinrangers defeat Garatto by allowing them to form Lupin Kaiser, so he flies off to catch up with the thieves to tell them he wishes to help. We briefly return to the Patorangers who suddenly split back into three, then we go back to Lupin Kaiser who defeats Garatto without too much difficulty. The Patorangers exchange some dialogue about the Lupinrangers defeating the giant Garatto before we return to Bistrot Jurer and the Lupinrangers talking about Good Striker, nicknamed Goodie by Umika. Suddenly, the Patorangers enter the restaurant. As the Patorangers walk in, Umika barely manages to hide Goodie in time and we see the two teams stare off when the episode ends. So what did you guys think of this week’s episode? Did you expect Good Striker to fuse the Patorangers? Let’s us know in the comments below!